John and I planted about 14 tomato plants today and started on another 14 (this is after John planted about 28 of them by himself). I’ll share this process soon, but for now, check out the gifts John gave me before I left his backyard. 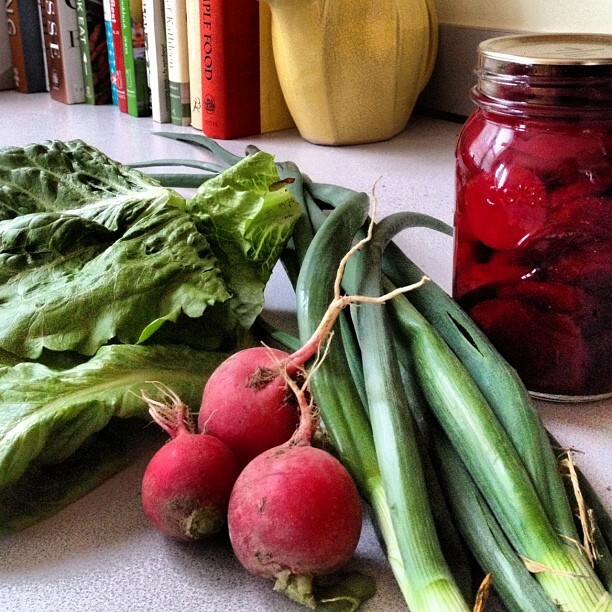 I scored three radishes, two spring onions, many beautiful romaine leaves, and a jar of pickled beets canned by John’s wife. Thanks for sharing, Kathy! Hard work does have its rewards. While spending the afternoon digging in dirt doesn’t seem much like work to me, I did get “manure tea” all over my hands today (more on that in another post). But when I’m rewarded with veggies plucked straight out of God’s good earth…well, it’s totally worth getting a little horse manure under my fingernails. Nothing makes me happier than digging in the fresh dirt with my bare hands – even manure (well composted of course)!!! Congrats! Sounds like you are having a blast! Awww, Ra! “Manure tea” all over your lovely little hands! But when I see the pics of the beautiful veggies–it’s worth it. VERY worth it! But I’m still trying to get stuff out from underneath my fingernails. Next time I’m wearing gloves!